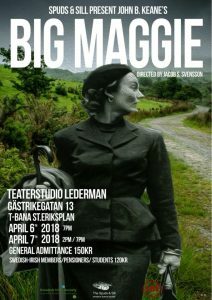 Book your tickets now for Big Maggie 6-7th April in Teater Lederman. 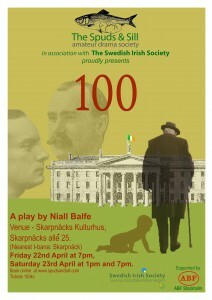 The play is set in Kerry in the 1960`s. Maggie, the widow of Walter Polpin, is with her four children at the funeral. Maggie, a matriarchal out-spoken woman who has lived 25 years in an abusive relationship is now the sole owner of the shop and farm. She has major plans for the future, which doesn`t sit well with her children. Scene 1 takes place in the graveyard during the funeral, Maggie, sitting aside with a cigarette and not actively involved in the wreath laying at her husband`s funeral. Scene 2 is set in the Polpin shop the evening after the funeral. The door is locked, the cash is counted and the curtains are drawn. The family are gathered and the children are waiting for the reading of their father´s will, but Maggie has other plans. Scene 3 three months have passed and we are back in the Polpin shop. Mr Byrne, a local man, with an eye for Maggie, is in the shop talking with Gert, the youngest of the Polpin children. Teddy Heelin, a handsome travelling salesman arrives and has his eye on young Gert. Scene 1 the scene is set in the Polpin shop later the same evening, temperatures are rising. Scene 2 a year has passed and we are back in the Polpin shop. Katie, Maggie´s oldest daughter is in doing her shopping and we realise that a lot has happened during the past year. Book in advance or be spontan! Just a reminder that you can buy your ticket in advance up until 3pm on Friday at which point we will close online sales. Not to worry though, thanks to the excellent theater we have this year we will have full availability on the door, 150kr and cash only of course. You’ll want a little extra cash for the intermission bar as well, we love small notes! Booking your ticket in advance, however, helps things run more smoothly on the night. We will also be keeping the first few rows of seats for those who’ve pre-booked. Can’t wait to see you all in Skarpnäck! 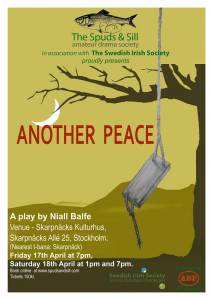 If you are availing of your Swedish-Irish discount on the night please bring along your membership card or show the email with your discount code.